This perfect parcel is complimented with both a charming Northwood&apos;s home and a vintage guest cottage. The home and cottage are surrounded by stunning landscape filled with gorgeous perennials. The home offers a variety of wood (butternut, birch, ash, hickory, pine) with a wall of glass to take advantage of the sunset views over big water. The home supplies 2 field stone fire places, is open, bright and carries breathless charm throughout with the master suite, open kitchen, endless dining, great room, family room and den. 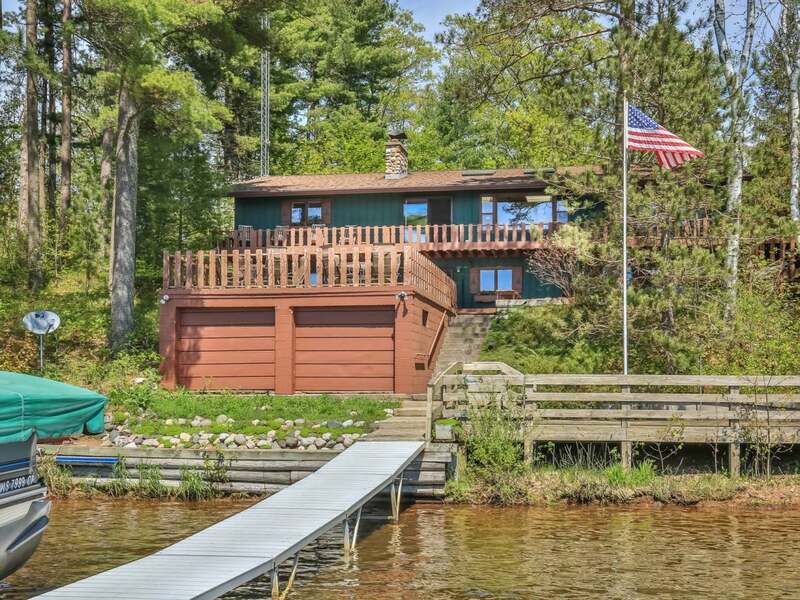 The house is great for recreation or entertaining with the party deck over the boat house and more deck and patio space you could ever imagine. Along with the 3 car garage, boat barn, and abundant storage in the home, the guest cottage is a true bonus with knotty pine, a field stone fire place, screened in porch and deck. A Northwood&apos;s package with charm and location. Exterior Features: Pier/Dock, Open/Sun Deck, Patio, Outbuilding, In-Ground Sprinkler Sys.